The Precor EFX 5.19 elliptical home trainer is one of Precor’s entry level elliptical machines for the home user. This company has made its reputation manufacturing true gym quality equipment for at-home use, and it shows in every one of their ellipticals. UPDATE: The EFX 5.19 is an old model that is no longer available. You can check out all of the latest ellipticals here or compare older Precor models on salehere. Professional trainers love the Precor line in general, and at about $2,800, the Precor EFX 5.19 is the most affordable for home users. Pros hail these elliptical home trainers as the ones all other brands aspire to be, citing the machine’s smooth motion and outstanding warranty as the best in the industry. The one drawback they see is the limited number of programs. At this price, they feel that you should have more than four. Home users love the feel and durability of the Precor EFX 5.19. This elliptical is a powerful home trainer that will last years, so buyers know they’ll be keeping it for years and won’t have to worry about repairs and upkeep. The machine’s upper body workout is appreciated, but some do wish that it wasn’t synchronized with the lower body function. If you are shopping for the best elliptical machine you can get, this is your best buy for under $3000. You just won’t find better movement, quality or function with any other brand. 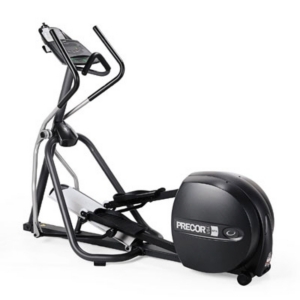 But be sure to check out a few of the other Precor models if you think you’ll be limited by the program selection or would like to be able to adjust the incline – the Precor EFX 5.19 home elliptical trainer has a set incline of 20 degrees.